Heide Museum of Modern Art presents Big Game Hunting, a major exhibition of recent works by one of Australia’s most prominent contemporary artists. The exhibition is the first survey of Fiona Hall’s work in Melbourne since 1994, and also marks the Australian premiere of Fall Prey, an installation that Hall created for the prestigious world art event dOCUMENTA (13) in Kassel, Germany in 2012. Fiona Hall emerged as a photographer in the 1970s and now works across a broad range of media, producing extraordinary works that transform mundane man-made materials into organic forms with both contemporary and historical resonances. Her pieces are painstakingly crafted with an attention to detail that emphasises the beauty and fragility of the natural world while engaging with issues concerning the environment, colonialism, consumerism and globalisation. Hall’s visual aesthetic is alluring yet confronting, encouraging the viewer to contemplate the politically charged messages which underpin it. Described as a ‘21st century hunter’s den’, Fall Prey is a menagerie of trophy-style sculptures of endangered species from the International Union for Conservation ‘Red List’, rendered in military camouflage. While resembling taxidermied specimens, these larger-than-life creatures are embellished with the detritus of contemporary culture—disturbing signifiers of the cultural and ecological changes that have wrought havoc on their natural habitats and contributed to their plight. The chimpanzee from the Belgian Congo for example, holds a Blackberry phone, a stark reference to the unregulated mining of coltan in the region for use in the electronics industry. The resultant pollution, and the miners’ hunting of apes for food, has critically threatened the local wildlife and natural environment. Surrounded by clusters of found objects and sculptural video works, the creatures in Fall Prey appear as part of a macabre yet wondrous wunderkammer, a cabinet of curiosities which forms the core of this compelling survey. The chilling Portrait of the Victor is a recent work relating to the Fall Prey series. It was made at the end of the devastating, thirty year civil war between the Singhalese military and the Liberation Tigers of Tamil Eelam in Sri Lanka and speaks of the harsh brutality of the regime. Hall first visited Sri Lanka in 1999 on a residency and since then has returned several times. She has created a number of works that engage with the country’s political situation as well as its unique natural environment. Understorey, in Big Game Hunting, was the first of these. Hall’s Kermadec work comprises painted bark cloth images, video and sculptural pieces inspired by a 2011 expedition to the unique marine environment of the Kermadec Trench on the Pacific Rim of Fire. Drowning Theory refers to a hypothesis proposed by scientists at Otago University, Dunedin, New Zealand, that the entire landform of New Zealand was submerged during its geologically volatile past until 23 million years ago, and therefore no living organism native to New Zealand could have lived there before then. The theory has since been discounted by most of New Zealand’s other geologists and biologists. 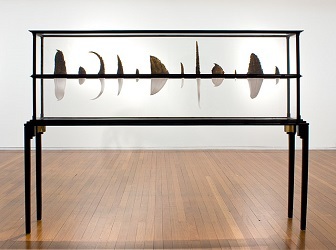 This work features the beaks of native New Zealand birds that are now extinct in their original natural habitat, such as the huia, Haast eagle and kakapo. Also included in the exhibition is an installation of innovatively re-designed beehives produced for the 2010 Biennale of Sydney and a suite of large etchings celebrating the flora and fauna of Arnhem Land. For more information, visit: www.heide.com.au for details.